Facebook‘s API has become less and less reliable in the recent past, All Facebook reports. Latency times have spiked, and Facebook says it is “investigating issues that may be causing some Platform apps to fail to load” altogether. 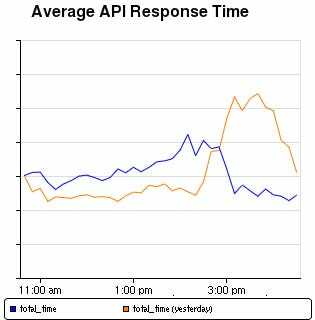 At SXSW, program manager for games Gareth Davis admitted that “February was a difficult month” for API reliability. Problems with the platform reached a new high on Monday, as shown in the chart. Facebook game developers spend a lot of money on Facebook ads. The rapidly expanding “Pay With Facebook” program, Facebook gets a cut of some the money app developers make from virtual goods purchases and other micropayments. The latter is still a relatively small part of Facebook’s pie, but its growing rapidly, and has the potential to be huge. With plans to open up its firehose reportedly in the very near future, this is something Facebook needs to get under control.